PHOENIX, Arizona, July 23. THE venue for the swimming competition at the 2012 Olympics, the London Aquatics Centre, is a marvel of construction. From its revolutionary wave-style roof to the 10-foot deep pool, the British have created a facility that has raised the bar for future Olympic venues. In this special five-part series, we will look back at the 22 venues created for swimming at the Olympics, the history behind their creation and what happened to the venues after the last splash. Our retrospective starts with the 1908 Olympics in London, which featured the largest swimming venue in history. The pool was built in the middle of the White City Stadium, where track and field events were also contested. Spectator capacity was 68,000, though standing-room only numbers inflated that to 97,000. This marked the first time swimming took place in an enclosed tank at the Olympics. Previously, swimming events were held in man-made lakes or natural bodies of water. London's pool was enclosed by concrete, but this was in the days before chlorine and other chemicals were used to treat the water. As such, the water was so cold and murky that competitors found swimming difficult. 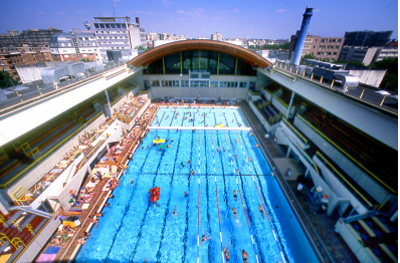 The pool in the White City Stadium was removed immediately after the Olympics, and the stadium was demolished in 1985. The headquarters of the BBC now sit in that place. 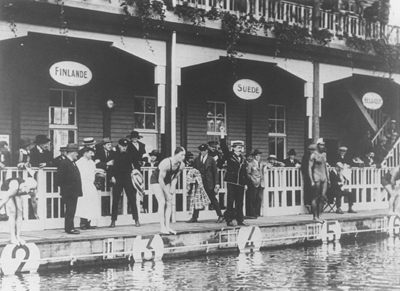 The next Olympics, in 1912, did not continue with London's practice, choosing to hold swimming competitions held in Djurg?rdsbrunnsviken, a bay in Stockholm, Sweden. The small country was awarded the eighth running of the modern Olympics when the International Olympic Committee revoked original host Hungary's bid, as Hungary was a German ally during World War I. The Stade Nautique d'Antwerp was the first official swimming venue created at the Olympic Games. Antwerp's pool was enclosed by concrete, and, like the White City Stadium pool in 1908, the water temperature and quality made swimmers uncomfortable. Athletes reportedly sprinted to warm showers immediately after their races. 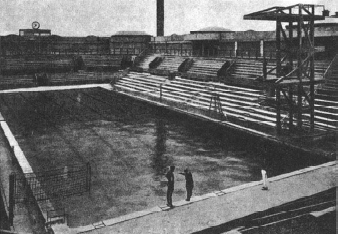 The Stade Nautique d'Antwerp, like many venues from the 1920 Olympics, no longer exists. The Olympics returned to Paris 24 years after hosting the Games in 1900. At those Games, the swimming races were contested in the River Seine, when currents helped swimmers post fast times. 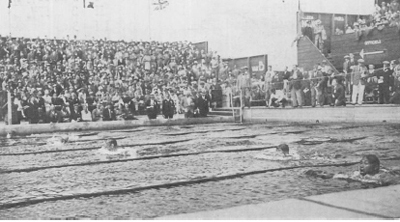 At the 1924 edition, athletes raced in the Piscine des Tourelles, which improved from the 1920 venue in that the racing course featured lane dividers. 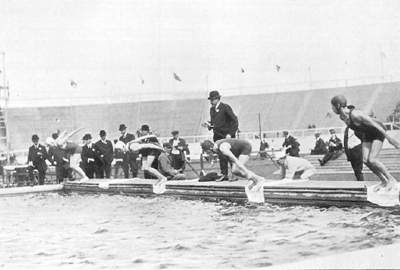 The water quality was still low, but the spectator attendance was much higher at 8,000 to see future Tarzan Johnny Weismuller win three gold medals. The pool was named after a French swimmer who competed in the 1924 Games, and has had a major upgrade, with a retractable roof installed for fresh-air swimming in the summer. Used mostly as a recreational pool, the facility has hosted a few lower-level international competitions over the years. Many of the venues in the Amsterdam Olympics were smaller in scale than those in Paris. The Olympic Sports Park Swim Stadium in Amsterdam seated nearly 5,000 spectators around a concrete basin that measured 50 meters by 18 meters. Similar to Antwerp, many of the Olympic venues in Amsterdam, including the pool, were demolished a year after the Games were finished. Los Angeles embraced the coming of the Olympic Games, building what was then one of the most spectacular aquatic facilities in the world. It was one of the widest (20 meters) and deepest (6.5 feet) in the world, which helped athletes break all but one Olympic record in the 11 events contested. 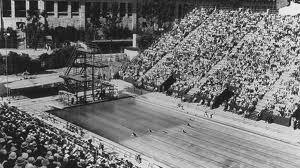 Spectator seating was at an all-time high for a venue created specifically for swimming, estimated at 10,000. Future movie stars such as Buster Crabbe and Eleanor Holm won gold medals in Los Angeles, and the Japanese men won all but one event. 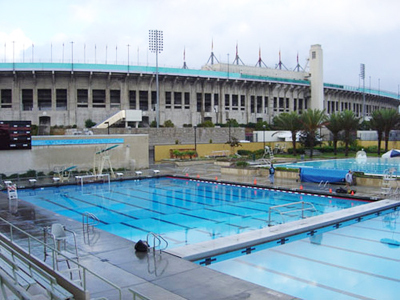 The Los Angeles Swim Stadium became the city's premier facility, hosting numerous national and international meets until 1984, when the pool built for the Games that year became the new standard. Now the pool is named the LA84 Foundation/John C. Argue Swim Stadium, featuring a heavy renovation around the facility's original skeleton. From the mid-1990s to 2003, the building was abandoned, forcing a $30 million remodel. It's still located next to the LA Coliseum and is now a public recreation pool and is reportedly the largest public recreation center in Los Angeles. Up next: A look at pools in Berlin, London, Helsinki and Melbourne.